Nailing your go-to-market positioning is really, really hard. Fortunately, there are helpful frameworks and tools you can use to capture your market positioning and refine your message. Judy Loehr, Venture Partner with Cloud Apps Capital Partners, distills her 15 years of go-to-market experience to provide critical go-to-market considerations, the hard truths about your market position, and a solid strategic framework for crafting your own positioning and messaging. Market positioning, at heart, is simply how you tell your story. It’s a forcing function that helps you to crystallize your strategy which can have a magnitude effect across the whole company. Great messaging builds awareness – press, investors, and prospects will all know your story. It also helps sales tell your story, and creates a sense of urgency for prospects, which can shorten your sales cycle. A strong market position also creates a shared vision and purpose for employees and your recruiting team. In fact, market positioning is a great way to get alignment across your entire company, to ensure that everyone throughout all of your go-to-market functions is following the same road map and driving towards a shared goal. Hard truth #1: No one cares. I’m sorry to break it to you but no one cares about your belly button, and no one cares about your product. Really. If your entire positioning revolves around your product, no one’s listening. Your go-to-market positioning should never start with your product. Hard truth #2: You’re not as aligned as you think you are. Even a 5% lack of alignment can sink an early-stage company and significantly stall the growth of later-stage companies. You need to be aligned 100%. Unfortunately, even if your team uses the same words and you think you’re all on the same page, you’re not. If you dig in, you’ll usually find that everyone comes with their own different assumptions and different interpretations. The good news is that going through this process of nailing your go-to-market positioning helps tighten alignment. Hard truth #3: You’re getting bad advice. What works for other companies may not work for you – in fact it probably won’t. It doesn’t matter what other companies are doing or what kind of wild success other companies have achieved with certain go-to-market tactics. Focus on the right business model, pricing, and go-to-market tactics for your marketing, your product, and your prospects. 1. Audience. This is first and foremost. Nobody sells to one homogeneous blob of prospects. What are your unique target segments? Fully understanding those unique segments (and the nuanced differences amongst them) is the most important foundational piece to have in place before you start anything else – and you can attack this even before your product has gone to market. 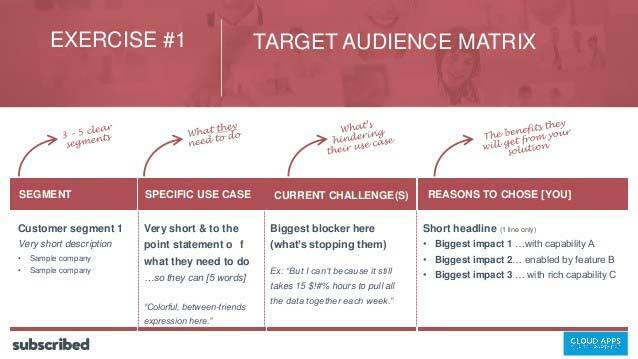 I recommend using the following target audience matrix to identify and clarify your unique target segments. 2. Channels. Once you know your audience, you need to know where they are looking and where they are learning. This will help you to understand how to best reach your target audience. 3. Pricing and packaging. This goes back to that hard truth #3. You can’t just try to copy what other companies are doing in terms of pricing and packaging. You need to “right size” for your segments and strengths. 4. Customer acquisition cost (CAC) strategy model. Work through your acquisition model and costs. 5. Messaging. Messaging comes last. You can only solidify your messaging within the context of everything else. An interview with Stanford Professor Dr. Baba Shiv on consumer decision making and implications for marketing, innovation and leadership. To help structure messaging, I like to use a framework that Tien Tzuo of Zuora calls “the three rooms.” Imagine three rooms – like in IKEA, where you are taken on a very specific path through the store: first to the living rooms, then the bedrooms, then the kitchen. It’s a very curated, structured experience. The rules for these rooms are defined: you won’t ever find a sink in a living room in IKEA. 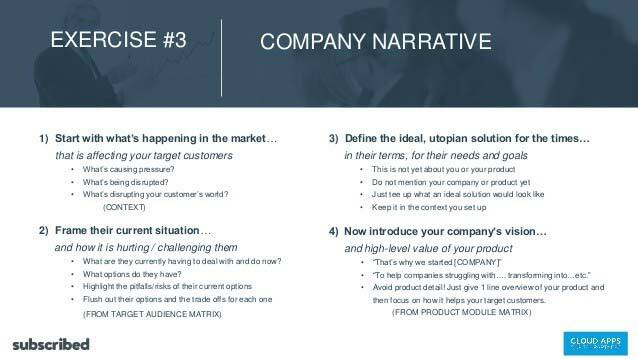 In the first room, you’re developing a compelling context for your company, approaching the question of “why,” and, even more specifically, “why now?” What’s going on in your market? What are the shifts? How are you relevant to what’s happening in the market? In room one, you do not talk about your product. You don’t even say your company’s name. Room one isn’t about you; it’s your context. What is happening in your space and why is this important right now? In room two you clearly articulate your value proposition for your target customers. The focus is on your target customer segments: how the “why now” context is affecting them, and the impact you could help them make on their business. If there’s an opportunity to attack a model and frame your positioning that way, seize that. What’s stopping your audience and what pressures are they under? What are their top priorities? What’s their biggest use case? If your top use case aligns with the company’s top three strategic priorities or your buyer’s top three priorities, you’re golden. Your goal here is to figure out how to talk about outcomes and how to connect with your target audience and their needs. Here’s where you first introduce your product, with a structure that reinforces your value. Your audience is prospects, but it’s really evaluators: those people who are considering your solution and evaluating how it may satisfy their needs. In room three you are not trying to make anyone an expert at your product. Rather than go into great product detail with endless feature lists, simply explain your product in the context of your value. 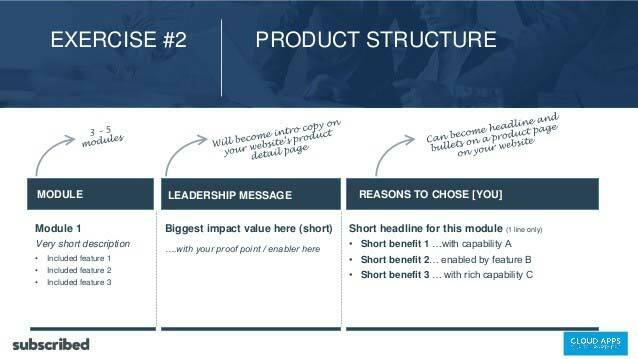 Your product should be structured to support and reinforce your value, and you should incorporate this structure into your product and demo. So your team has gone off-site and worked through this together, traveling from room one to room three. Now it’s time for your entire leadership team to bring all that together as your company narrative. This is literally an internal word doc, not for public (or board) consumption. But in the end, you’ll have your core end-to-end story that you can leverage on your website, in your product messaging, in your sales presentation, in your marketing collateral – everywhere! Company alignment around one story. Great positioning gives you a structured way to talk about your product and your value proposition, but most importantly it’s a way to connect with real people. When you hit upon your go-to-market positioning, you’ll recognize it – and others will too. Great go-to-market positioning is all about what I like to call “nodding along context.” When someone cares about the context, they’ll care about your product – and want to know more. And this is when your business will really begin to fly.